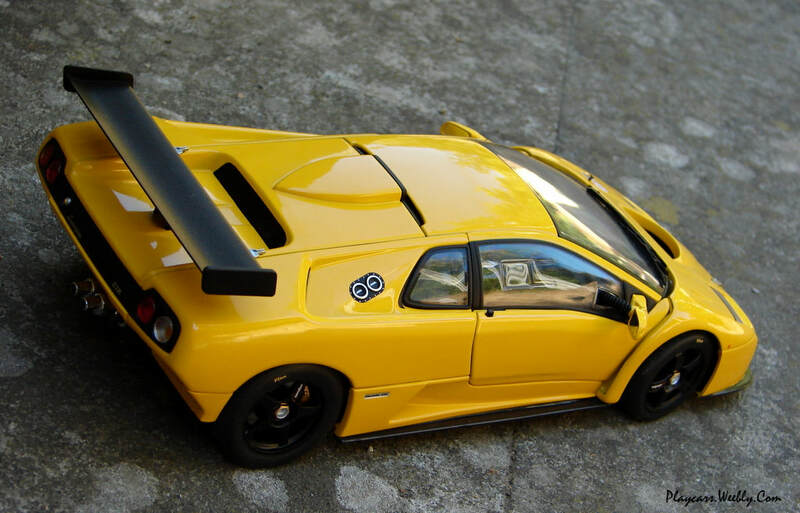 Built in only 30 copies, the GTR represents the only track version of the limited edition Diablo GT and was considered back in 2000 the best handling Lamborghini ever. It was equipped with a carbon fiber chassis, except the doors for safety and rigidity reasons, a single racing seat, a fire suppression system and a roll cage, all of these taking the place of the traditional interior to save the weight. A huge spoiler, racing brakes and magnesium rims came to complete the new car. The V12 engine from the GT was considerably modified for track use and was the most powerful engine, the italian house has ever done. 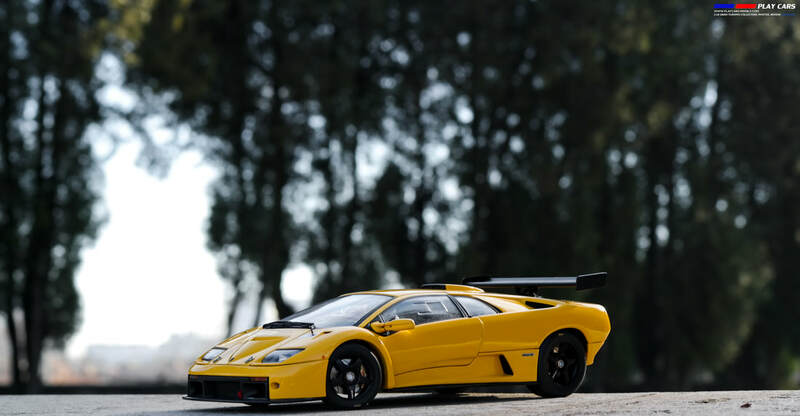 Are already 9 years since AutoArt released the Lamborghini Diablo GT as a part of their Performance series. 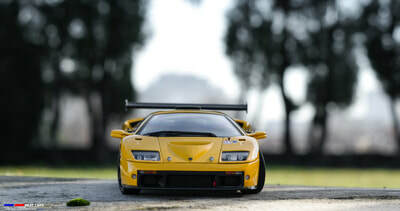 So, when I'm writing this review (2013), is considered to be an old generation model, but the differences in comparison with the recent releases are minimal, Autoart being known for their great replicas from the beginnings and I can tell that this one is amazing. Starting with the traditional yellow paint, applied in a consistent and not very shine coat and continuing with exemplary made lights, printed carbon effects for the spoiler's lip (unfortunately on my model some signs of a possible future peeling are already visible), real mesh for the air vents, is easy to prove the great attention for the details on this model. 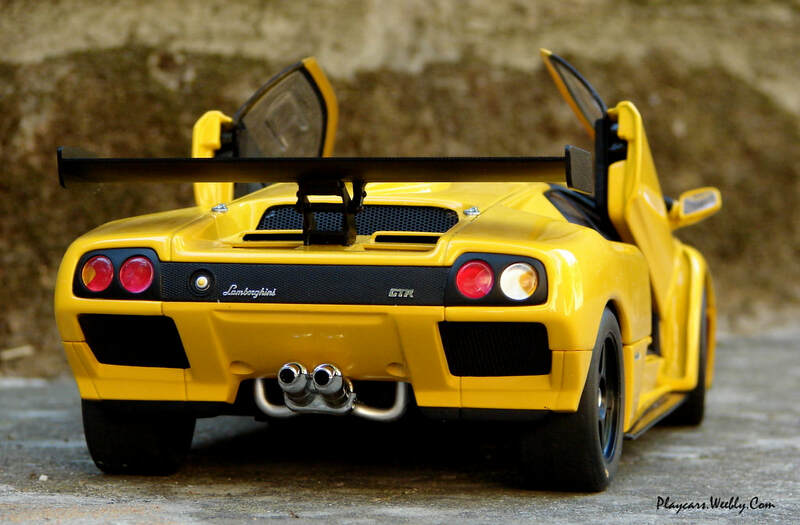 Its proportion and stance are true to the real thing and once exposed the model keeps an aggressive posture, appropriate for a track car. 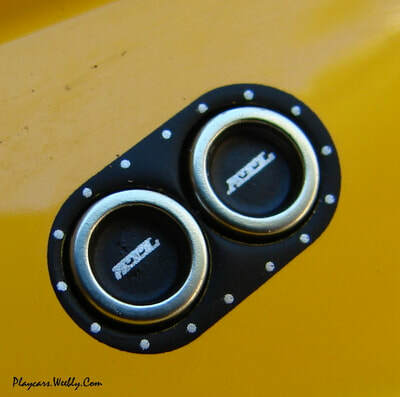 On the rear side the air vents are beautiful cut through and covered with perforated grills, except the tight one between the stop lights which keeps the photo etched parts lettering the name and model of the car. 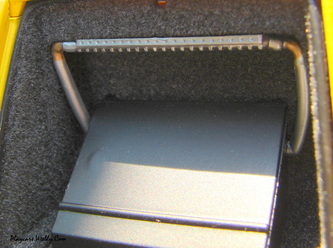 The plastic on the huge spoiler was textured, to replicate the carbon from its real counter part and the final part of the exhaust system is covered in a correct chrome effect. I should mention here the little details like the tampo applied badges all around, the safety clamps, raised as single pieces on the both lids, the electric turnoff switcher and the tow ring. As usual when we come close to an AutoArt model, the wheels represent the strongest part of the exterior. 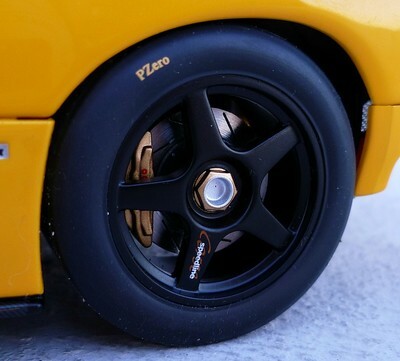 They replicate the Corsa Speedline rims perfectly: painted in black, they keep the lug nut in two color tone, in the same way as the original part, making you think it's a separate piece and on one of the spoke was inscribed the rim's pattern. The brake system is entirely visible and great detailed, featuring brake disks covered with a metallic coat and dimpled, painted and Brembo branded calipers . Being a car developed for the track, nothing was more appropriate than slick tires, made from a very soft and realistic material and inscribed with one of the best brands. One of the first issue appears when I try to open the traditional scissor doors. Their hinges are somehow weak and can't keep the doors open or to align them with the rest of the body when come in the close position. I must say I don't agree either the opening system that Autoart wants to replicate from the real car, this one making more difficult the doors manipulation. The doors are provided with racing type windows and even a ventilation pipe for the cockpit can be seen next to the mirrors. Being a racing car the interior was detailed in the same way revealing a lot of great details and the manufacturer desire to replicate even the last one. The first thing that remembers the race track is the roll-cage and right after the single Momo shell seat and a fire extinguisher. 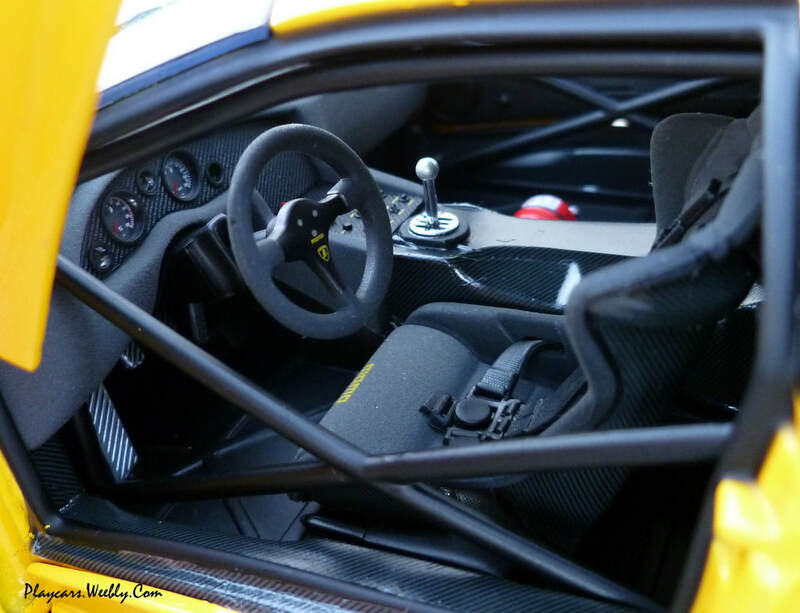 What catch your attention first is the finishing, the carbon pattern is everywhere: on the doors entry, on the back of the seat, on the central console or dashboard and looks amazing being replicate by a printed pattern. Back to the driver seat, is the best I ever seen in a racing model car, perfectly molded and covered with a textured material to replicate the real Alcantara. 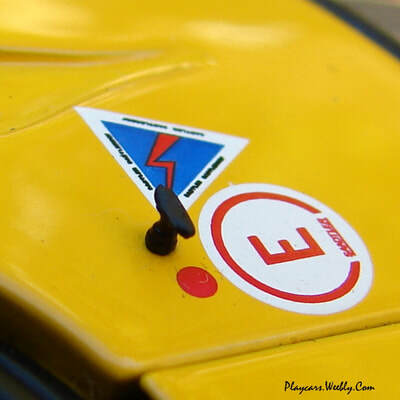 The same material is present on the superior part of the dash board and on the steering wheel. Everything looks so damn realistic, on the central console we have a lot of buttons and switches, made as separate pieces and marked! The indicators are unbelievable, being individually molded and detailed with a legible sticker. Everything inside here is such a beautiful experience of realism and attention to details. 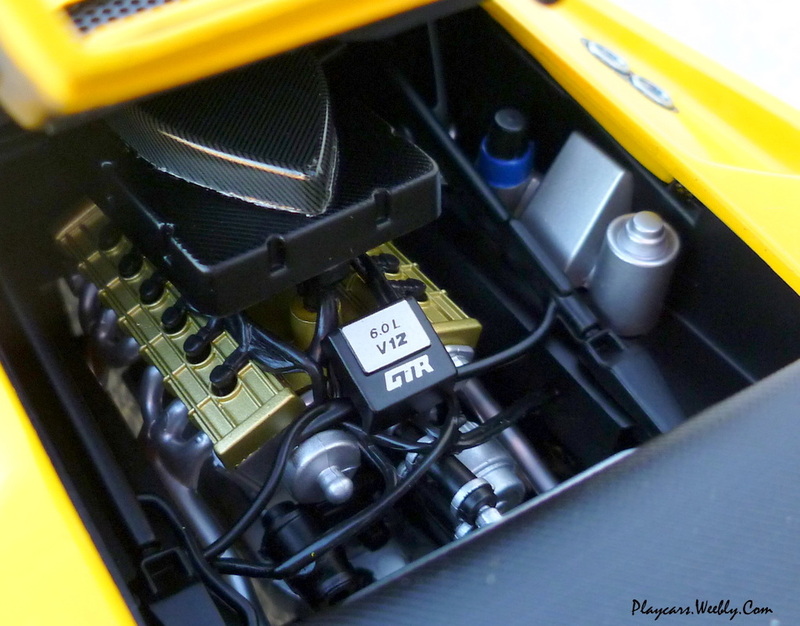 Opening the rear engine compartment, we can discover the V12 unit which didn't lack the same attention of detailing. 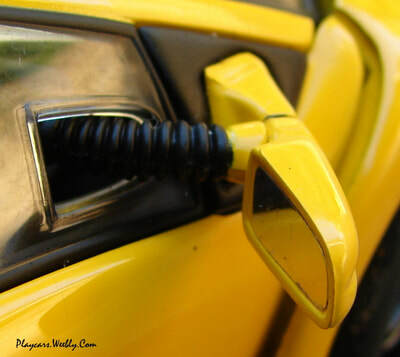 Is made of separate pieces, wired, having the enormous air filter covered in printed carbon, some lids and hoses crosses everywhere. Everything here leads to a great result. In the front, we find a small carpeted space including maybe some of electronic system ( I'm not sure). 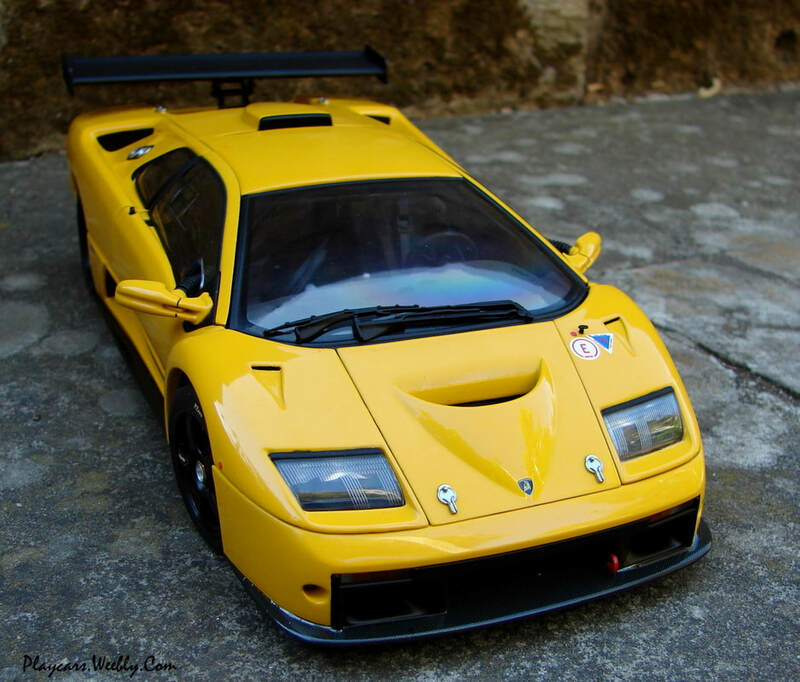 AutoArt managed to replicate the single and the best replica of a superb and unique Lamborghini car just as they used to. 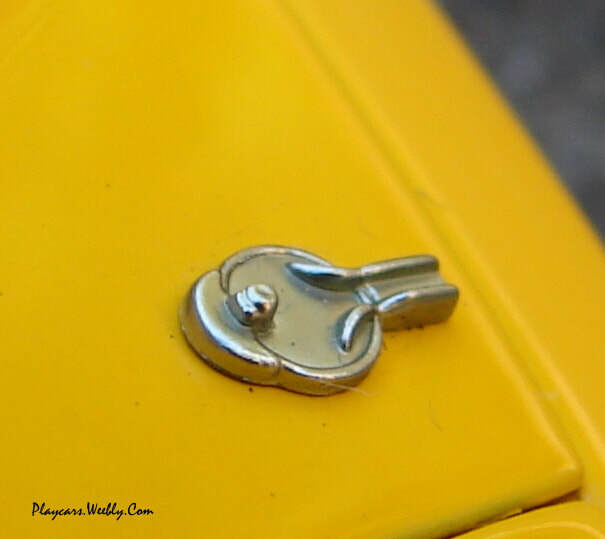 Their effort is remarkable, this model is full of little details everywhere, inspires quality and great finishing. Successful details stand out if you are to looking from the exterior, into the cockpit or to the engine bay. 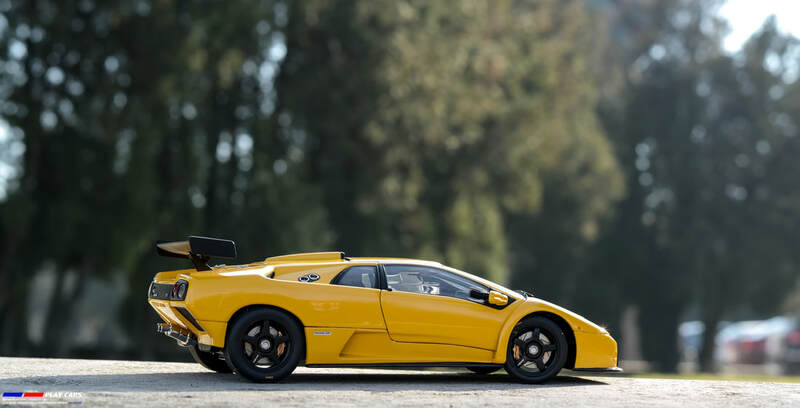 Dedicated not only to the enthusiasts of the italian house, this model meets all the conditions to be a great replica of the real car and a proof that the manufacturer is trying to give it all the best when it comes to scale models.